The Music Parade is one of the biggest tours in all of Europe – with more than 100,000 visitors each year. In the first three months of each year, the Music Parade makes the rounds of the biggest arenas in Germany, making it one of the most successful show productions in Europe. The musical journey offered by the Music Parade is also quite diverse: the focus is on brass music of all kinds, including traditional military music, famous marches, film music, folk, classical and pop standards, and even modern rock and pop, all presented by the world’s most successful marching bands. Each year, the no more than seven Music Parade bands are completely reassembled from the best players in the world. The official world champions in brass music are there as are bands from every continent. 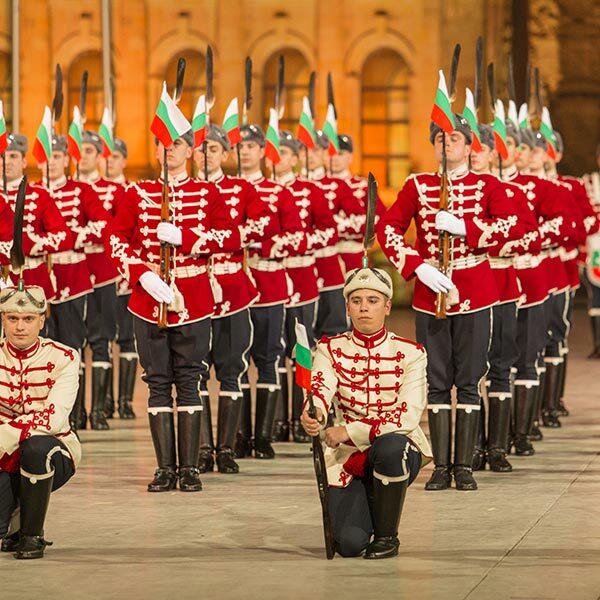 Particularly fascinating is the international character of the Music Parade: civil and military bands from east and west, north and south, making music together – a great contribution to international understanding. Rarely does a great show bring together so many nations as the Music Parade. For many years, a portion of the entrance fee has been donated to charity. The current projects we support are described on the German-language site. 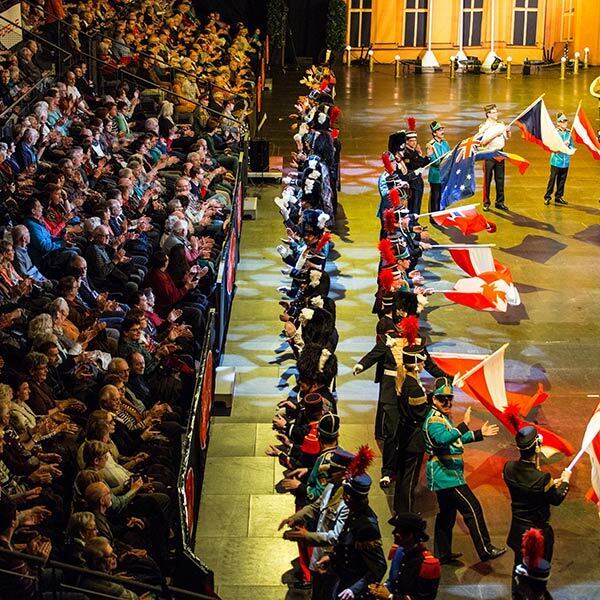 There’s a lot to see in the three-hour show full of gorgeous, colourful uniforms and imaginative choreography. After the grand opening by the Orchestra of the Nations, with musicians selected from the various bands by the chief conductor, each of the bands performs and marches on its own. The highlight is always the grand finale, where all of the bands come together and some 400 musicians make music together. 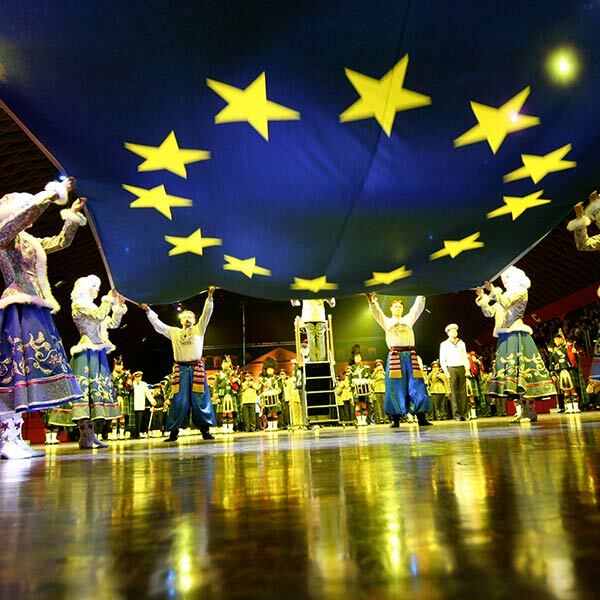 You will be fascinated by one of the most successful tours in Europe: the Music Parade. Music festivals such as the Music Parade are often called „tattoos“. The term originates from the Dutch „tap-toe“ and refers to what was originally a military ceremony. In addition to the Edinburgh Tattoo, the best-known in Europe, another major tattoo is the Berlin Tattoo held in Germany’s capital. In its early years, the Music Parade was primarily a festival of military music, but visitors today are now treated to a variety of band music for the whole family. International Music Parade scouts visit bands around the world to find out about the latest developments in global brass music. In recent years, a wide variety of bands have been on stage: from military music corps from countless nations such as Germany, USA, France, Poland, Russia, Ukraine and many others to a Dutch brass band on bicycles and jogging mountaineers from Italy. Bands from all over the world from Mexico, India, Oman and Qatar to Australia and New Zealand are performing with us today. Tickets are available at all the usual ticket agencies in Germany (and sometimes abroad). In our online ticket shop (only available in German), tickets are available at the guaranteed lowest prices. Tickets will be sent by post only within Germany. We recommend those buying tickets from abroad use the convenient print@home function. Support in German or English. The Music Parade is a member of the International Military Music Society.